Brett Lautenbach, president of NRG Esports and the San Francisco Shock, told Compete via phone that the organization would not comment any further about Bateman’s case. Compete asked Lautenbach for the text of this “zero tolerance policy,” as well as whether team members and staff have to agree to the policy upon hiring, and whether any employees at NRG would be willing to discuss the process of developing and implementing the policy. Lautenbach declined to answer any of these questions. Compete emailed NRG’s CEO Andy Miller with the same questions, as well as a more specific question about exactly what types of misconduct fall under the auspices of this policy. Miller has not yet responded. Whatever the policy says, it must’ve been strict enough to allow NRG Esports to fire Bateman within 14 hours. It’s common for esports organizations to cite supposed “zero tolerance” policies when scandals arise about team members or staffers. Earlier this year, Toronto Esports fired one of their Overwatch pros after he streamed a racist rant on his Twitch channel, at which time Toronto Esports’ president cited “a zero-tolerance policy for any forms of discrimination.” The player got fired within a day of the video going viral online. More recently, a League of Legends pro got cut from his team after a Twitch live-stream in which he screamed at his girlfriend and trashed his room, culminating in what sounds like a visit from the local police. His team acted even faster than NRG or Toronto Esports; they fired him within hours. These firings have so far been popular ones. There has been little to no public outcry against the removal of racists or abusers. However, the vague and all-encompassing nature of these policies—as well as the fact that they only seem to kick in when there’s a social media outcry—introduces the potential for misuse. In practice, the term “zero tolerance” appears to mean that staffers get one strike and they’re out. But it’s not clear what types of behavior these organizations have “zero tolerance” against. The games industry is no stranger to smear campaigns and social media crusades against unwitting targets. Not every incident will be as cut and dry as video evidence of an Overwatch pro screaming racist slurs, especially as esports grows in size and visibility. If Max Bateman’s case had arisen after Overwatch League pre-season begins on December 6, his firing could have gotten more complicated. 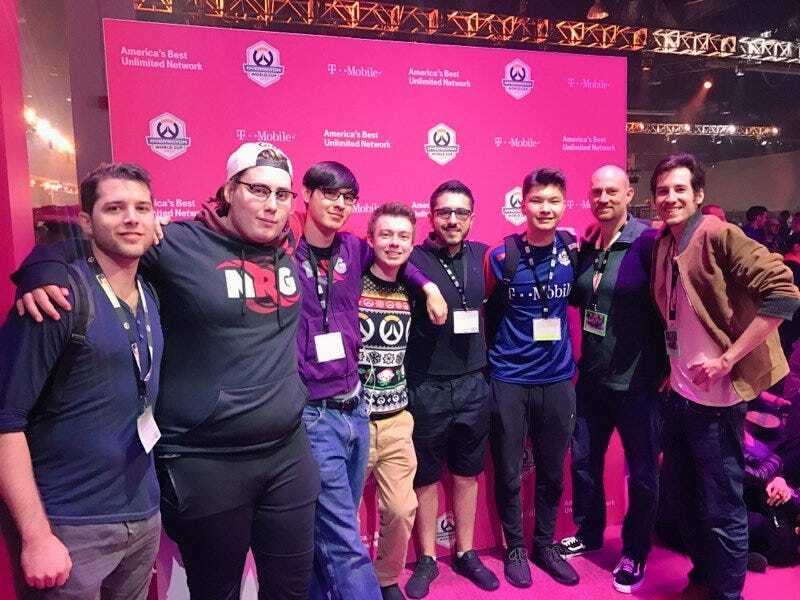 Before his firing, Bateman described himself as a team manager for the San Francisco Shock, the NRG Esports team in Blizzard’s Overwatch League. However, Blizzard told Compete that Bateman was “not an Overwatch League team manager,” despite Bateman and the San Francisco Shock claiming otherwise. And since Overwatch League’s pre-season hasn’t started yet, Bateman’s case unfolded during a time period when NRG Esports could operate without considering Blizzard’s code of conduct. A Team Member may not, during the North America League, commit any act or become involved in any situation or occurrence which brings him or her into public disrepute, scandal or ridicule, or shocks or offends the community, or derogates from his or her public image or reflects unfavorably upon Blizzard, Heroes of the Storm or any of the other products, services or sponsors of Blizzard. This ruleset does not have a “zero tolerance” policy towards misconduct. Punishments for misbehavior range from a fine to a firing, depending on the situation. For example, earlier this year, Blizzard decided to bench a Heroes of the Storm pro for a week after he harassed a popular Twitch streamer. Much like the other incidents cited above, that situation came to Blizzard’s attention after it went viral on social media. Blizzard’s policies have vague enough language about “unsportsmanlike conduct” to encompass all manner of sins. As esports grows, so too will the possibility that angry gamers will try to inflict their own justice and start campaigns to get people fired. Esports organizations should clarify the terms of their policies about misconduct, and in so doing, they should also look to the failures of traditional sports when it comes to “zero tolerance” policies, which can create further problems for victims. Traditional sports leagues have always struggled with this. For decades, they simply turned a blind eye to domestic violence; once public pressure increased after Ray Rice, the NFL went into damage control overdrive. When it comes to doling out punishments, they still seem to be making it up as they go. Esports has operated in relative obscurity for years; as its moment in the sun approaches, it seems like they’re on the second part of this progression. It’s not too late for these organizations to implement more nuanced policies and be transparent about what behavior is and isn’t acceptable among esports pros and staffers. Given that confusing smear campaigns have been effective for angry gamers in the past, esports can’t afford to wing it on this one.